Clean-tech startup EnGoPlanet harnesses kinetic energy to potentially power cities around the world. Shortly after Hurricane Sandy knocked out major parts of New York City’s power grid in 2012, Serbian-born Petar Mirovic founded the clean-technology startup EnGoPlanet. Earlier this year, the NY-based company announced a partnership with the city of Las Vegas which would see them implement four streetlights powered by kinetic electricity. This month, the Nevada city became the first in the world to install the smart streetlights powered by pedestrian footsteps. As harmful carbon emissions continue to be a massive contributor to climate change, EnGoPlanet’s contributions to the Las Vegas strip utilise strategically placed kinetic pads to harvest energy from each footstep that hits it. The energy of motion, kinetic energy can be harvested to generate electricity, which would otherwise be wasted. There are also solar cells atop each LED streetlight, as well as motion sensors that allow for light on demand, wireless charging and WiFi hotspots for smart devices and two USB ports. While Las Vegas may be the first city to make use of the kinetically powered streetlights, it’s not the first to use pavements and roadways to aid in the generation of electricity. 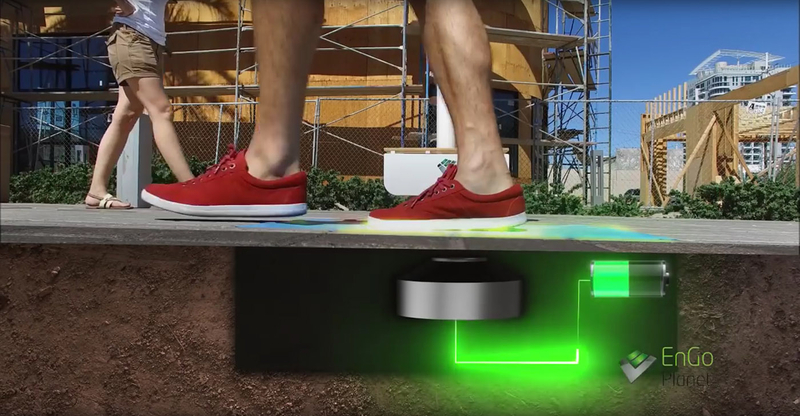 A company called Pavegen has been producing floor tiles that can generate renewable energy since 2009. In fact, in 2015, the green tech company installed a kinetic walkway in Johannesburg’s Sandton City that collected energy to provide deprived local communities with lighting, heating and basic everyday amenities. Approximately 1.4 billion people worldwide do not have access to electricity or public lights. This renders many rural areas dark and unsafe and access to the outside world is limited due to lack of power. Keen on bringing their multi-purpose, emissions-free solar-kinetic streetlights to energy-deprived communities across the world, EnGoPlanet has launched a crowdfunding campaign via Indiegogo to make this possible. With tentative installation plans for 10 rural African villages, they hope to provide greater electricity access for areas where just the charging of a cellphone can incur astronomical fees. “When a person walks, they generate 5 watts of energy continuously, so you are, we all are, a 5-watt power-feed. Now imagine 10 people,” Pavegen CEO, Laurence Kemball-Cook explained in an interview with Futurism, “that’s 50 watts of energy continuously.” In this way, free and clean energy is, quite literally, all around us; it just takes the right kind of sustainable infrastructure to produce – something that EnGoPlanet is certain they’ve managed to perfect.